Please do the survey. PLEASE. 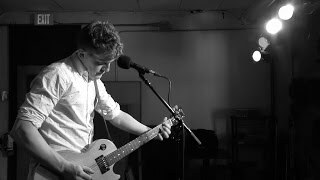 An Empty Room with Eric Taylor - "Dreams In Colour"
SaskMusic is pleased to announce the call for submissions for our 2016 compilation CD. Following the success of our numerous annual compilation releases, this version will be intended for promotion and distribution to Canadian media and industry professionals, as well as international markets. Physical CDs and download cards will be distributed at music industry events such as BreakOut West (Regina), SXSW (Austin TX), Canadian Music Week (Toronto), The Great Escape (U.K.), Reeperbahn (Germany), and other national and international events that SaskMusic will have a presence at throughout the year. This compilation will serve as the calling card of Saskatchewan music worldwide through the year. Representing the best new music by our province’s diverse array of artists, it enables SaskMusic to highlight a curated selection of songs that opens doors to showcase opportunities, radio airplay, publicity, and licensing opportunities for our artists. We are seeking submissions from all artists, from emerging to established artists, in any genre. We hope to include the “best of” in a wide range of styles, and from across Saskatchewan. Previous compilations have featured artists including Alexis Normand, Andy Shauf, Alex Runions, Belle Plaine, Close Talker, Codie Prevost, Deep Dark Woods, The Dead South, Def 3, Factor, Jason Plumb, Jay Semko, Jeffery Straker, Jess Moskaluke, Jesse Brown, Keiffer Mclean, League of Wolves, One Bad Son, Pimpton, Rah Rah, Royal Red Brigade, The Sheepdogs, Shooting Guns, Slow Down Molasses, Zachary Lucky, and many many more. Please note: You must be a resident of Saskatchewan, and a member of SaskMusic in order to submit. For more information, please contact us at 1-800-347-0676 (toll-free in Saskatchewan) or info@saskmusic.org. 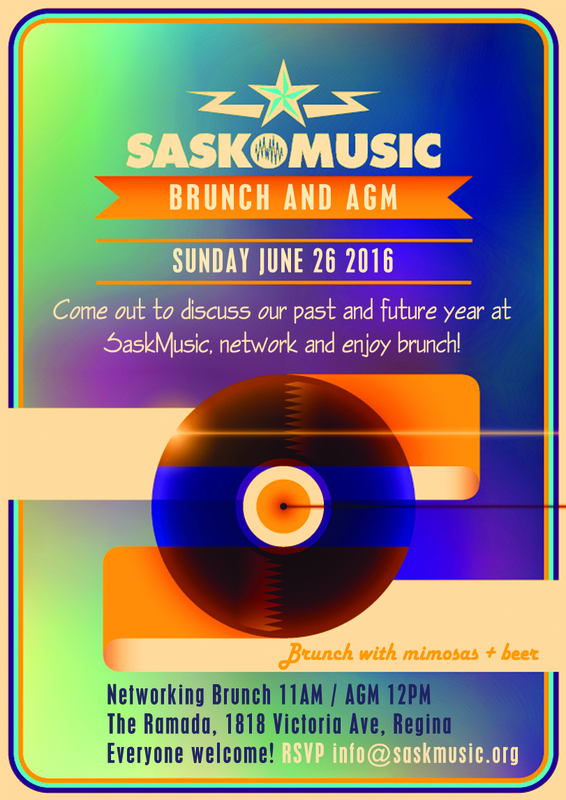 NOTICE IS HEREBY GIVEN that the Annual General Meeting (“AGM”) of the Saskatchewan Recording Industry Association (SaskMusic) covering the period of April 1, 2015-March 31, 2016 will be held on Sunday, June 26, 2016. You must be an Individual, Band or Corporate Member of SaskMusic to vote on any motions presented during this meeting. However, youth members and guests of members are welcome to attend as observers. Members and non-members alike are invited to join us for brunch. The main items of business to be dealt with at this Annual General Meeting are noted in the AGM package. There are six, 2-year-term positions to be filled on the SaskMusic Board. Signed nomination forms must be received at SaskMusic before 5 pm on Thursday, June 2, 2016 in order for a Nominee to be included in the advance online voting process. SaskMusic is pleased to be in Brighton UK for The Great Escape. Continuing our successful and longstanding partnership with Manitoba Music, Alberta Music, and Music BC, we will co-present a showcase under the BreakOut West banner at TGE on May 21 at Brighton’s “The Green Door Store.” This year’s BreakOut West showcase includes two Saskatchewan acts, Surf Dads and Queen City Stoop Kids, alongside Western Canadian artists Joe Nolan, The Velveteins, Living Hour, Yes We Mystic, and We Are The City. Surf Dads and Queen City Stoop Kids received official showcase invitations from TGE organizers this year. The Great Escape is the UK’s premiere music business conference, bringing together thousands of music industry practitioners for three days of talks, panels, showcases, and business-to-business events. The convention runs alongside The Great Escape festival, “Europe’s leading festival for new music,” which showcases 400 bands at 35 venues during its run. The UK is the largest music market in Europe and acts as a barometer for buyers, media, and music partners around the world. Surf Dads and Queen City Stoop Kids will appear at official TGE showcases (details below) before continuing on with their respective UK/European tours. These artists will also perform at the Liverpool Sound City Festival and industry conference from May 27-29, 2016, and Surf Dads at a special BreakOut West standalone showcase in London on May 23, 2016. Every player, every band, every sound tech, every music store, every studio owner, every concert promoter, every door person, every publicist, every artist manager, every venue owner, every record label, every festival programmer, every instrument manufacturer, every component of the industry matters and we need your voice to be represented in the current Economic Impact Survey being undertaken by Creative Saskatchewan and Praxis Consulting with assistance from SaskMusic. From symphonies to cover bands and from all ages basement shows to arenas, your contribution is vital. We urge you to please take a few moments and complete this survey. All Skills Labs events are free for SaskMusic youth/individual/band/corporate members, or $20 each for non-members. All participants must pre-register as space is limited. Register online by clicking here or by calling 1-800-347-0676. SaskMusic’s Skills Lab Series focuses on developing the fundamental tools that artists and music professionals need to build their careers. We tackle one specific topic each session in a friendly, hands-on learning environment. It’s an opportunity to learn or practice business skills that are key to the ever-changing music industry, in an intimate and comfortable atmosphere where we can offer peer-to-peer mentorship and networking. Are you getting excited for the big sounds of MoSo 2016, June 16-18 in Saskatoon? Sweet. But did you know there’s more to MoSo than music? Now in their 6th year, MoSo has grown past its social media and technology roots to focus on the convergence of creativity. So, if you’re into design, music, content creation, technology, business or simply inspiring your community, you’ll enjoy MoSo 2016. SaskMusic subscribers are offered a 20% discount off of an already great price: $200 + taxes if you purchase before May 27 (full price: $250 + taxes). Just use the promo code “mosolovessaskmusic” when you buy your ticket. We’ve cut the fat. The biggest stuff happens all in one day (Friday), with more talks and workshops taking place on Saturday. Check out our full schedule. More value. Free stage with MoSo programming. Lower ticket price. More opportunities for connecting with some of the most creative minds from Canada and US. More networking. More parties, ‘speed networking’ and more. And in case you missed it, MoSo was recently recognized as one of the top unconventional business conferences in Canada by Mercedes Benz Magazine. Jessica Walsh, Art Director at Sagmeister & Walsh in New York, and one of the world’s top design minds. Terry O’Reilly, CBC radio host of ‘Under the Influence’ and one of Canada’s most disruptive thinkers in the advertising industry. Jesse Brown, Canadaland. Journalist who broke the Jian Ghomeshi story. Saadia Muzaffar, Founder of TechGirls Canada. Leading advocate for women in science and tech. Featured on CNN Money, Canadian Business, and Vice. Lisa Charleyboy, Editor-in-Chief of Urban Native Magazine. Named by Huffington Post as one of three Aboriginal Millennials to watch. Dioselin Gonzalez, Virtual Reality senior engineer at Unity Labs. Worked with Pixar Studios, and with DreamWorks on How to Train Your Dragon 2. Sam Sheffer, Creative Producer at Mashable. Creates engaging content for one of the world’s most read/watched online content portals. The point of MoSo is to bring creative communities together for an event of learning, networking and fun: Get inspired. Discover your new favourite band. Learn about the latest technology. Meet your new business partner. Add your distinctive ripple to the greater waters to help create a tidal wave of creativity. Again, make sure to book before May 27 and get 20% off the full ticket price. Canadian Musician Magazine with Paper Bag Records and ole label services present a free webinar. May 31, 5pm CST. Register here. Finding success as an indie musician is a balancing act between art and business. It requires connecting with an ideal fan base, showing them who the artist is and what your music is all about. This month the Regina Public Library, with support from SaskMusic, presents Saskatoon singer/songwriters Rachel Elizabeth and Sarah Farthing for Songwriting Stories (performance), Sunday, May 29, 2-3pm at the RPL Central Branch. Rachel Elizabeth is the artist formerly known as Fern. Rachel is celebrating her name change with a swanky new website, a Saskatchewan tour and the release of ‘The Spendthrift,’ a single that arose out of a songwriting collaboration with Juniperus (Jeffrey Popiel, Saskatoon). Sarah Farthing is a "smoke-and-honey voiced songstress" (CBC Radio) whose sound hits the sweet spot between folk-rock, roots, and blues, with just enough swagger to avoid the usual cliches of the female singer-songwriter. Farthing's new full length album "When Your Answer Comes" is a dark, mature, and rootsy collection of songs that contain just a hint of wild west flair. This event is free to the public, free parking downtown Sundays, and dainties, tea and coffee provided. On Sunday June 5, Creative City Centre presents their last BTS show of the season, featuring songs and stories from Jenny Berkel, Poor Nameless Boy and Kim Fontaine. Doors 7:30pm, show 8:00pm. $15+GST Advance, $20+GST at the Door. All Ages / Cash bar (19+ with valid ID) / Rush seating. Following the feature performance, there will be an open stage sponsored by SaskMusic, where anyone is welcome to share one or two of their own songs. The next meeting of the Regina Regional Writers Group will be held Thursday, June 16, 2016, 7pm at the SaskMusic Regina office (1831 College Ave). All songwriters are welcome, whatever your skill level or style. A chance to network with fellow writers, share ideas and take part in some writing exercises. This will their last meeting until fall so mark your calendar! Hosted by Scott Anthony Andrews and Wanda Gronhovd, in partnership with Songwriters Association of Canada. Changes to Canada’s cultural policies would be the first major overhaul in decades, as Heritage Minister Mélanie Joly announces the launch of public consultations with consumers and content creators with an aim to bring Canada’s cultural properties – everything from the Broadcast Act to the CRTC – into the digital age. Then consider taking part in the pre-consultation questionnaire, before May 27. "We are a young couple getting married on our farm August 6, 2016. We are looking for a musician or group that would be willing to perform during the ceremony/cocktail hour/reception/dance. Vocalist/guitarist/percussion etc. The style of music we are looking for would be indie/pop/rock with a range from Mumford and Sons to ACDC to Adele. Contact ustynajasonwedding@gmail.com"
Location: by Plenty and Dodsland - 190km west and south of Saskatoon. Serious replies only to this call please. If you are a musician or vocalist who has performed on a sound recording released during the last 50 years, there may be money waiting for you! The Musicians Rights Organization Canada (MROC) is a not-for-profit organization that distributes neighbouring rights and private copying royalties (Re:Sound) to musicians and vocalists. Note: This is a different royalty than that distributed by SOCAN to songwriters! 2. Tell them about the sound recordings you've played on. Congratulations to Ray Whitton, Roland Corrigal, and Kara Golemba, the top 3 of Run-off #1, moving on to the 620 CKRM Proudly Saskatchewan finals show,. You can be in the audience for Run-off #2, Sunday, May 29, 2pm at The Exchange in Regina. Scheduled to Perform are Bruin Eberle (North Battleford), Brian/Ryan Kendall (Saskatoon), Lauren Klein (Broadview), Justin LaBrash (Lumsden), Devin LaRochelle (Gravelbourg), Mabaleka (Saskatoon), Mandy Ringdal (Outlook) and Justine Sletten (Hazlet). Tickets are $10 for adults, $5 for kids, available at the door. The run-offs are the qualifying rounds leading up to the Grand Finale – Saturday June 4, 2016 – Casino Regina Showlounge. Tickets for the finals show are $15 and available now from the Casino box office. The Finale will feature a very special performance by Open Road Recording artists, The Hunter Brothers. Vote and help Moose Jaw! Vote MOOSE JAW! The community's 1 of 5 in the running to host a Meghan Trainor concert through AIR MILES Canada Detour and needs your vote! Watch the promo vid about the local music scene, and vote here before May 31!. Wanna open for Meghan? Enter the BIG BREAK artist contest with a unique performance video of an original song! TMETV (The Millennial Edition TV) on Access 7 (Access Communications, Saskatchewan) is looking for musical guests to feature on the series. Suitable artists can be from any genre, but need to be able to perform acoustically on-set, and should be primarily between the ages of 18-30 (as the series is about Millennials in Saskatchewan). Selected artists would be interviewed and perform 1-2 songs on the show. To submit an artist for consideration, contact: Spencer Burridge, Production Assistant – Access 7, 306.565.6600 ext. 5594. This is just a sample of listings from the Saskatchewan Events Calendar - shows happening around the province, and by Saskatchewan artists playing throughout Canada.